This volume includes three Japanese handbooks. They are all discussed on this page, which has basic information about them and details on the 50 different pieces published there. Few exist from publications in China, so they survive today because of their publication in Japan. All have lyrics, many following a ci pattern (see list). The page also has links to extended comment on a number of these. This handbook, published in 2001 (Chinese edition 2015) attempts to recreate the most complete such handbook. Originally dated 1710, it is missing 10 pieces from the above-mentioned 50 (four are different versions of the same titles here), but to the remaining 40 it adds a further 17 pieces, making 57 pieces in all. Of these 17, 11 are instrumental, though five of those were almost certainly intended to have them; all other pieces have lyrics. Yang Yuanzheng is currently a professor at Hong Kong University, which keeps an online copy (backup) on its website. Yang Yuanzheng, Japonifying the qin: the appropriation of Chinese qin music in Tokugawa Japan, Ph.D. Thesis, Hong Kong University, 2008. Political implications in Japan of this work. Chongxiu Zhenchuan Qinpu (1585) ? All but 1614 focus on qin songs. Unfortunately, Yang gives no reference for his statement that six were brought, and he only directly names the last four. It is thus not clear whether he is making his own inference, following someone else's inference, or basing this claim on actual historical record. He mentions the first two handbooks on page 35. On that page he also mentions Zheyin Shizi Qinpu (before 1491; handcopy only), Faming Qinpu (1530; not as well known but compiled in Nanjing) and Shen Qi Mi Pu (1425; no songs). However, these last three seem less likely. In his dissertation Yang gives several examples of people trying to play directly from several of these handbooks. However, as yet I have not found that any of the melodies in these handbooks was directly copied into one of the handbooks produced in Japan. Interestingly, Lixing Yuanya has five melodies for one string qin, but to my knowledge there is no information suggesting this is connected to the development of the Japanese ichigenkin. The melodies I have reconstructed aside, most of this section of the website consists of details of various guqin handbooks produced in Japan, together with listings of their content. Because the three handbooks included in Qinqu Jicheng have considerable overlap in content, these contents are given here as three appendices on a single page rather than separately. The information in this section about qin music published in Japan largely concerns melodies in the first two categories. These largely comprise those from Japanese publications that have been re-published in the modern Chinese compendium Qinqu Jicheng. 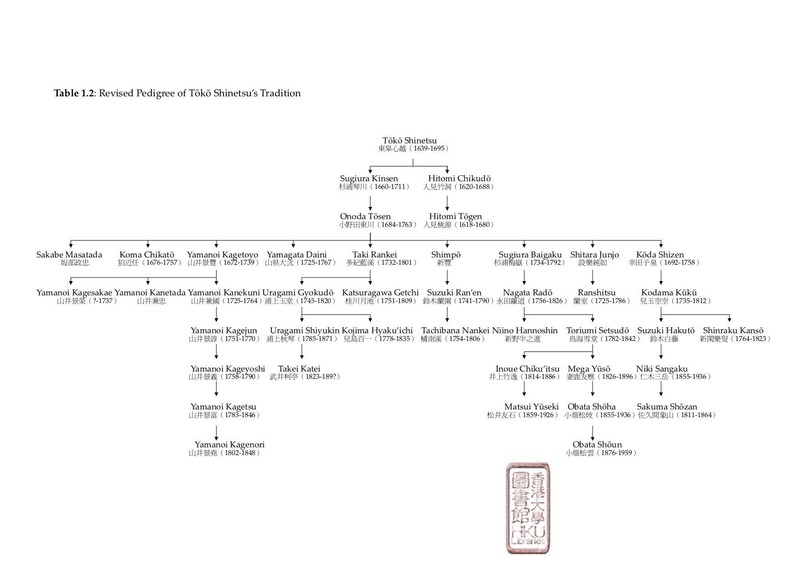 As mentioned, they are representative of the tradition of qin music brought to Japan in 1577 by Jiang Xingchou (1639-1695), who in Japan became known as the monk Toko Shin-etsu (and other names).22 Over the following 20 years or so he taught a number of students. Many handbooks following Shin-Etsu's tradition were produced later in Japan, generally with the title Toko Kinpu. According to the accompanying commentary on these by Zha Fuxi,25 he also knew of a number of other Japanese qin handbooks, some of which he had seen,26 others of which he had not.27 But his commentary further expressed the opinion that these handbooks (or at least most of their melodies) derived from the ones he did include. The publication in 2001 of an "Orthodox Toko Kinpu" was intended to clarify which of the qin melodies published in Japan could actually be connected to Shin-Etsu himself.29 As mentioned, because the accompanying web page, Japanese Handbooks in Qinqu Jicheng", is largely based on information in the old Japanese qin handbooks re-published in China (in QQJC), it does not really clarify the issue of where the music came from. 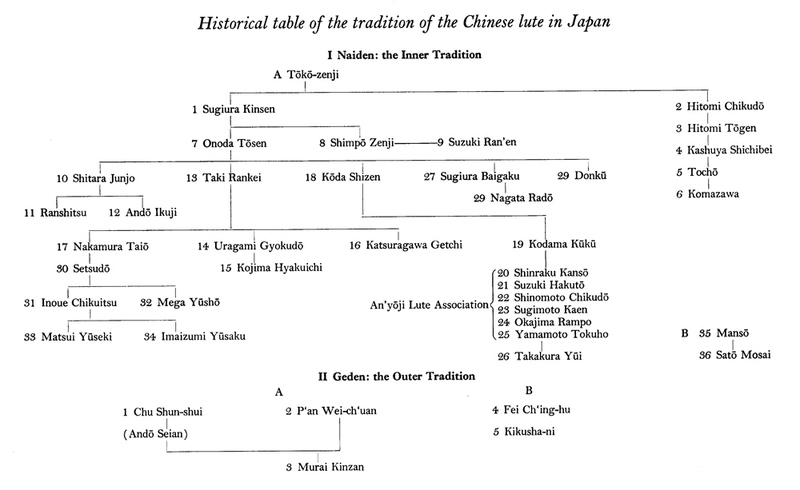 The "Orthodox" version certainly helps clarify some of the issues, but at present it seems that there are still many unanswered questions about qin repertoire in Japan at that time. Up to the present my main source of information has been 琴曲集成 Qinqu Jicheng (QQJC). Unfortunately, the material there is incomplete because, as mentioned above, some crucial handbooks were not available to Zha Fuxi. Yang's chart is in his Japonifying the Qin, p. 32. Yang disagrees with Van Gulik about there being an "outer tradition" and so revised his chart accordingly. For Van Gulik see Lore of the Chinese Lute, p.233. Van Gulik's chapter "The Chinese Lute in Japan" is very detailed on the subject. Note, however, that many of the people mentioned here are not in the chart. Also, in quoting Van Gulik here I change "Chinese lute" to "qin" as I find the word "lute" very misleading as well as inaccurate. For early Chinese music in Japan see the page on gagaku as well as what is written about Japan by Van Gulik in his Lore of the Chinese Lute. Although the most ancient guqin melody, You Lan, was preserved in Japan, there are instruments that were preserved in Japan, and there is evidence suggesting the qin was indeed played during the Heian period (794‐1185), nothing is known about the actual players or the melodies that were played. Further knowledge is complicated by the fact that literature and painting suggest the Japanese often used the character "琴 qin" when referring to their koto, correctly written "箏 zheng". If there were players prior to the arrival in Japan of Jiang Xingchou in 1676, nothing is known about them or their msuic. By far the most important here is the qin music associated with Jiang Xingchou (Shin-Etsu; 1639-1695), who began teaching soon after he arrived in Japan in 1676. Until the modern period all players apparently followed or developed from this style (see the chart at top; Yang disagrees with Van Gulik's idea of an "outer tradition" shown in Van Gulik's chart at right. Nevertheless, arguments exist about to what extent this music came exclusively from China, or to what extent it was either modified in Japan or, in some cases, newly created in there. Other that this, during this period there is the music of Uragami Gyokudo (1745-1820). Although he originally trained in the lineage of Shin-Etsu he then developed a unique style, or at least unique melodies, that apparently did not continue much after him (further detail). As the chart at top shows, by the 20th century there were few players in Japan. When Van Gulik was in Japan in the 1930s he could not find any local qin players. The revival began after China opened up and people could study qin there again. Thus the modern tradition is based on direct study from China rather than from the tradition of Shin-Etsu. Playing melodies from Shin-Etsu's tradition must thus be based on reconstruction rather than continuing a living traditon. There are many paintings and books collected in Japan that are important to guqin study. However, a study of this is beyond the scope of this website. Cipai deserve special mention here, as qin handbooks in Japan (even compared to the ones Jiang brought there, which have many qin songs ) are unusual in their heavy use of lyrics in this poetic form (for more on this see Cipai and Qin Melodies). The titles of these melodies are generally the name of the cipai, with a subtitle referring to the specific theme of the lyrics. One would think that once one had devised a melody for lyrics that fit a cipai, one would then apply other lyrics to the same melody. However, there is no evidence that this was done. Instead, as with #22 and #23 there seems to be a tendency to make new melodies for the existing lyrics. Sometimes a melody may have "詞 ci" in the title but not be classified as a cipai (e.g., Zhu Zhi Ci). In addition, a melody may have the name of a cipai but lyrics that do not follow its structure. These I have always done independently, without looking at other people's reconstructions until my own are complete. Because the tablature omits direct indication of rhythm, I think it is important to have independent interpretations, then to compare and analyze them with those of others. The third, the short Nan Xun Cao, seems to be the same as in the original. Usually I do not have confidence in my reconstructions unless I have made a transcription, enabling me better to examine the structure. These melodies, however, are quite straightforward have and structures similar to other melodies I have reconstructed. Here the transcriptions are tentative, as I am not yet confident of the structures I have found. This page was begun many years ago, when I first reconstructed melodies from Japanese handbooks. Only in 201i8 did I see a copy of the "Correct Toko Kinpu". As a result the pages in this section are not quite unified. It is not yet clear to me how accurate this is as a reconstruction of the 1710 original, as I have not yet seen either the 2001 Japanese edition or the volumes on which it was based. Thus, for example, I do not know whether the original was actually printed or just hand copied. In addition, often melodies from handbooks are handcopied and circulated separately. They may claim to be from a particular handbook, but it may be difficult to know how accurate the copy was. 楊元錚 Yang Yuanzheng is a professor at Hong Kong University. His book 古吳汪孟舒先生琴學遺著 (Valued Writings of Qin Studies by Mr. Wang Mengshu of Old Wu. Beijing, 2013) is also very useful to this study. There may be more, but it is not yet certain, for example, whether the six mentioned here were complete copies or hand copies. Some further handbooks exist in Japanese libraries, but I have not yet seen a study of this. The fusang/waka melodies in Toko Kinpu Zhengben may be the earliest evidence of attempts to create Japanese melodies for guqin. If many more attempts were made they don't seem to have been written down. From of old, the qin music of national songs has never become popular in the world. Sugiura Kinzen’s effort on waka ...... is [one of these efforts in vain]. It is because qin players are Confucians, not gakunins (musicians). Confucians like [Chinese] poetry, not national songs. For those who master the national songs, there are koto and biwa ready to accompany the songs. There is no need for them to play the qin. Therefore, efforts to compile the qin version of the national songs are all wasted in vain. After all, it is better to follow the old saying: "To transmit and not to invent, to believe in and to be devoted to antiquity." "...The shogun ordered the official musician Tsuji Buzen-no-kami together with Onada Tosen to to work out (qin) versions of Japanese songs. When these versions were ready, they were played in the palace of the Shogun. 德廟命伶宮辻豐前守輿廷賓，謀被本邦之樂於七絃，曲成也，進奏於殿中。"
These attempts, however, seem to have had bit scant success. The majority of Japanese qin players aimed at singing the qin melodies in as purely Chinese a way as possible...."
Of course, all this might be related to the fact that, even in China the tradition (and/or nature) of the qin has always been, while not necessarily Confucian, to eschew mass appeal. 14. Did all the music in Japanese qin handbooks come from China? Handbooks such as Hewen Zhuyin Qinpu are sometimes said to have only had tablature that was brought to Japan. However, it is clear from Japanese writing of that time that Jiang Xingchou modified some melodies for his students. Quite likely he also created new songs while in Japan, as qin songs seemed the best suit for his "market". The idea of local creations may be supported by the inclusion of the "fusang melodies", said to refer to melodies created by Shin-etsu in Japan, and the waka (for which no lyrics were included). But even the ones said to be waka do not seem necessarily to have had their music inspired by Japanese idiom. Besides qin music in the Edo period, the other exception to the Japanization of foreign music might be in the more ancient Japanese court music tradition, which consciously attempted to preserve music brought from Tang dynasty China. However,the research of the Cambridge Tang Dynasty music research project suggests that in the Japanese attempts to preserve this music they actually changed it so much as to make it unrecognizable. Yang, pp.111ff, writes about Ogyu Sorai's attempts to show this melody was actually created by Confucius. As can be seen by the discussions on this and the related pages there is some disagreement about which melodies were actually brought to Japan by Jiang Xingchou. For example, it is not clear whether some melodies assumed to have been brought to Japan were actually copied later by Shin-Etsu based on a memory of something he had played before he arrived in Japan. These may include many of the melodies that handbooks say he (or perhaps one of his students) revised. 14610.93: room name of 宋，魏衍 Wei Yan, a Song scholar with probably no connection to here. There are also such online references as 曲肱軒主人 and 曲肱居士. However, I have not yet seen any comment saying what Qu Gong Xuan refers to here. "東皋三一山人手挍于曲肱軒 Donggao Three in One Mountain Man Personally Examined it in Qu Gong Xuan"
"曲肱軒秘譜 Qugong Xuan Secret Tablature"
"曲肱軒藏譜 Qugong Xuan Collected Tablature"
"曲肱軒藏譜，凡四闋 Qugong Xuan Collected Tablature, in four sections"
Yang mentions Qugong Xuan, but without comment. These "Japanese" melodies do not seem to differ in style from the other melodies in Hewen Zhuyin Qinpu. See, however, the piece called Fuji. (Murai) was not satisfied with the tradition established by Shin-etsu, whom, being a priest, Kinzan deemed unworthy to touch the qin. In 1785 in Nagasaki he met the Chinese scholar Pan Weichuan, and from him learned the qin. Therefore Kinzan considers himself the only Japanese who possesses the real Chinese qin tradition.... He says that later he continued his studies of the Chinese qin on the basis of the materials of Zhu Shunshui...."
None of the melodies in Shin-Etsu's tradition is overtly Buddhist other than the ubiquitous Shitan Zhang, a piece in many handbooks but with few descriptions of how it might have been played before it was transformed into the instrumental melody called Pu'an Zhou. Tachibana Minamikei 橘南谿(1782‐1806), a doctor of Chinese medicine and amateur qin player who lived in Tsu‐han, recorded Onoda￼Tōzen’s qin versions for the gagaku pieces 越天樂 Etenraku, 五常樂 Gojōraku, and 拔頭 Batō in his unpublished manuscript Kingaku zasshi 琴學雜誌 (Gaku‐kin nos. 157‐159). These three pieces are among the 10 discussed here, but I am not sure if the versions are the same. I am also unsure of how all these might be connected a project overseen by Onada Tozen in 1735 whereby 25 qin notations were made from gagaku melodies (Yang, p.186). From what I can tell these transcriptions were always performed by qin together with ensemble. And although the fact that I have not yet heard of people describing having heard or played them solo does not mean this didn't happen, it suggests that this was never a signifant trend. On the other hand, such solo performances do seem to fit better Gyokudo's known inclinations. Because this page focuses on the melodies from Shin-Etsu and his followers that have now been published in Qinqu Jicheng, the emphasis is on the first two categories above. Zha Fuxi did not include any handbooks such as the one by Uragami Gyokudo, published in 1791, presumably because it focused on a more idiomatically Japanese repertoire. Perhaps much if not all of this was inspired by gagaku music; in this case is should perhaps be included in the previous category. Further details of Gyokudo's handbook are given on a separate page, Gyokudo Collection Qin Handbook. This does not mean that text preserved in Japan, particularly from the Togaku reperoire, cannot be used to gain a better understanding of Chinese music from that period (further comment). Specifically regarding the titles, the implication seems to have been that, on the one hand, during the lifetime of Toko Shin-etsu (1639-1695) his handbook was called simply the "Qin Handbook with Lyrics and Pronunciation" (和文注音琴譜 Hewen Zhuyin Qinpu) and that, in constrast, the use of his name in titles came later (i.e., "東皐琴譜 Toko Kinpu") means Qin Handbook of Toko's Music). Then, according to the dates Zha Fuxi gives, Hewen Zhuyin Qinpu was the first, and the earliest; the latter two have in their title the words "Toko Kinpu" (or "Toko Kimpu": "Qin Handbook of Toko") in accordance with the common tradition for titles of Japanese tablature connected to Toko Shin-Etsu. Regarding the former, Zha Fuxi's dating it to "before 1676" suggests the opinion that it consisted of the music brought to Japan by Shin-Etsu. As for the other two, perhaps the use of the words "Toko Kinpu" in the title seems to suggest that these handbooks consisted of melodies Shin-Etsu taught in Japan, not simply the ones he brought there. However, an examination of the melodies in the handbooks themselves suggests that the actual content was more complex than that. In fact, Van Gulik's writings about this seem to divide the music into, on the one hand, simple melodies that Shin-Etsu would have taught to novices (including both ones he brought to Japan and ones he himself created there, i.e., the Fusang melodies) and, on the other hand, melodies that he would have taught to more advanced students (or perhaps simply played himself). This is discussed further in this entry. See R. H. Van Gulik, Lore of the Chinese Lute, in particular pp. 226-227. The original commentary by 查阜西 Zha Fuxi (QQJC XII/ii-iii) was edited for publication in 1994 by 吳鉊 Wu Zhao. For more on Zha Fuxi see details of his Guqin Work. Includes four songs seldom seen elsewhere, 春野 Chun Ye (Haruno)，富士 Fu Shi，山里 Shan Li and 山櫻 Shan Ying (further comment). QQJC includes the fifth and sixth of these handbooks. They were apparently copied by the well-known modern musicologist 田邊尚雄 Tanabe Hisao (1883 - 1984). 幸田子泉舊藏 Old Collection of Koda Shisen (d. 1758), in 7 folios, with 51 melodies. See also the reference above to the "earliest" of these Toko Kinpu. The Sugiura Kinsen volume is apparently the basis for the new correct edition of Toko Kinpu published in 2001. In this regard see also the pieces in the "orthodox" volume mentioned in the next footnote. here is a list of the pieces that, in spite of the fact that it may have been published earlier than them, it has that were not in either Hewen Zhuyin Qinpu or in either of these two Toko Qinpu. This handbook, the title of which could also be translated as the "Complete Toko Kinpu", was published in a limited edition (50 copies) by the senior Japanese qin specialist 坂田進一 Sakata Shinichi (information from the 秋月齋 Autumn Moon Studio, which also sent the Table of Contents, on which this page was based). It would be interesting to compare this with the 1709 edition mentioned above. Note also the inclusion in this handbook of more of the advanced melodies, such as Liu Shui and Ou Lu Wang Ji. Here it might be noted that Van Gulik, ibid., said that he initially was quite convinced that all the melodies brought by Shin-Etsu were so simple that he must not have had very advanced students, and perhaps he himself was not such a skilled player either. However, noting mention of other handbooks Shin-Etsu brought with him, Van Gulik added that more recently he had revised his opinion, at least holding open the possibility that Shin-Etsu and some of his followers actually were quite skilled. Here it would be interesting to know how the versions from Japan of such melodies compare with the ones surviving from Chinese handbooks.